For sophisticated wireless flash setups, there's nothing like the new Speedlite Transmitter ST-E3-RT*. Facilitating radio controlled, two-way wireless transmission up to 98.4 feet, among up to five groups or fifteen individual Speedlites, the ST-E3-RT represents the next generation in wireless flash systems. With operational controls similar to the Speedlite 600EX-RT, including diverse flash metering options, and a number of flash modes, the Speedlite Transmitter ST-E3-RT makes complex lighting setups simple. With a compact design and highly reliable construction, combined with a clearly laid-out information panel and buttons with back lighting and more, the Speedlite Transmitter ST-E3-RT is an indispensible tool for advanced, professional flash photography. 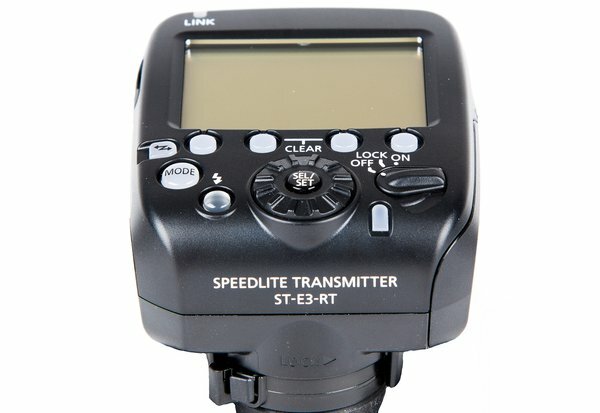 *Because it does not have an optical transmission function, the Speedlite Transmitter ST-E3-RT is not compatible with earlier Speedlite models such as 580EX II. It is only compatible with flashes with Radio Triggers built-in like the 600EXII-RT, 600EX-RT, & 430EXIII-RT.